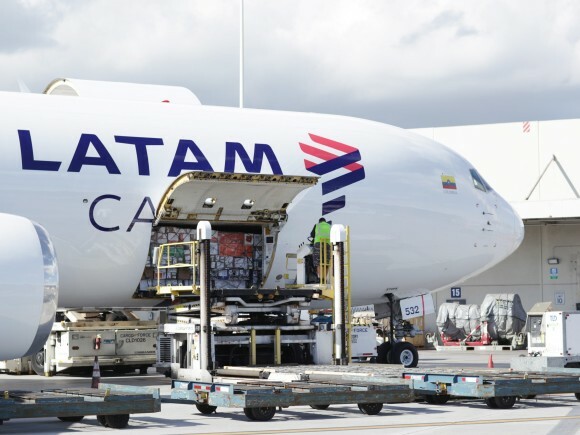 As part of its PERISHABLE project, LATAM Cargo Brazil has started the construction of a cooler facility in Guarulhos (Brazil) to offer more capacity and a more reliable connection service for the increasing perishable volumes being exported from Latin America to the world. Specifically, this new facility means LATAM Cargo will be able to store 33% more perishable cargo compared to what they can offer nowadays in their connecting hub. The new PERISHABLE HUB will have 17,620 square feet (ft ²), out of which 8,880 ft ² (50% of the space) will be coolers. The facility will include 2 areas: one storage cooler of 5,242 ft ² set at 32-36ºF, and other with 3,638 ft ² set at 36-55ºF for storage and re-palletizing purposes. Also, the system has the capacity to increase the temperature in any of its coolers up to 77ºF in case there is a specific perishable that request a different temperature range. Through the use of these coolers, LATAM Cargo will be able to fulfill all needs of the main perishable products exported by the region: salmon, asparagus, mango, cherries, berries, southern hake and flowers, which individually have the need to be stored at different temperature ranges. One of the main benefits of having this facility is that LATAM Cargo will be able to reduce the time exposition of the cargo, since the re-palletizing process will be done under a temperature-controlled environment. In addition, with all the cargo stored at the same location, the preparation and transportation process to the aircraft will be more efficient. As an added value, the time the perishable products are out of the temperature-controlled area is minimized, thus maintaining the freshness of the cargo longer. Approximately more than 45% of LATAM Cargo’s volumes are perishable shipments and currently 14% of these shipments –more than 24,000 tons- transit through GRU. Salmon, fruit and asparagus are the most transported perishables. According with Claudio Torres, South America Commercial VP LATAM Cargo, as a result of an upward trend in the transportation of perishables and with a commitment to evolve with the needs of their customers, the Company continuously seeks and implements new tools and processes to help maintain the freshness of this cargo. “We are very excited to share this investment with our customers as it will greatly benefit them by providing a more robust alternative to continue expanding the perishable exports’ volume from Latin America to the world,” commented Torres. With a network of more than 140 destinations –only in 2018 a total of 32 new routes were opened– Guarulhos has become a strategic hub for LATAM Cargo thanks to its connectivity between Latin America and the world. The new PERISHABLE HUB will benefit much of the perishable cargo carried from and within the region, such as the goods transported to Miami, London, Madrid and Paris, among others. PERISHABLE is a product of the LATAM Cargo portfolio that specializes in the carriage of perishable freight. Thanks to its thorough knowledge of the properties of Latin American commodities, LATAM Cargo offers a service that preserves their attributes from the point of origin until their final destination. To that end, it relies on cold chambers to keep temperature constant while reducing delivery time. It also implements specific measures depending on the nature and origin of the product.